The house feels overstuffed when the entire Tanner Family shows up for Thanksgiving, pushing DJs organizational skills into overdrive. The gang tries to get their magic back with an 80s themed party. While the She-wolf pack is watching Hamilton, Kimmy goes into labor. 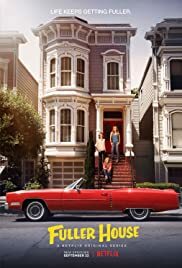 How many episodes of Fuller House have you seen? Kimmy Gibbler: My moves are all that and a bag of chips, so talk to the hand loser! Oh snap, you go girl! I think I just did! Just watched the first episode and was really enjoying all the original cast members. That is, until about the seven minute mark when the writers and producers felt obligated to show their left wing agenda and stick in a anti Trump comment. Although I watched and enjoyed the rest of the show, I doubt I'll continue watching. Regardless of one's political leanings, an otherwise cute show was ruined by going political.